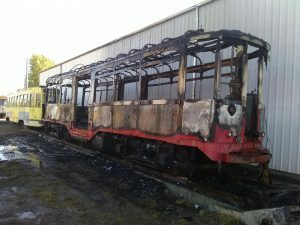 We had a very unfortunate incident with our Milan Interurban Car # 96, the car and an accidental fire. It is believed to have been an ember from a small grass fire got into the roof and engulfed the car. Most of the wood was burned and the siding of the carbarn was scorched. Car #96 was in much worse shape than expected. The fire expose that a good portion of the paneling was held together by bondo, and that all the window sills were thoroughly rotted. We need a second carbarn. With drier, hotter summers, the risk of fires outside is becoming greater. This leaves all the streetcars sitting outside as a fire risk. With a second carbarn we can move all our outside equipment inside. If we can move #96 inside, it can be preserved for eventual restoration. Milan interurban car 96 has quite a storied history. Produced in Milan Italy in 1930 it was one of only 4 cars in a series. Car 96 was imported to San Francisco in 1986 for the historic “Muni Trolley” festival. 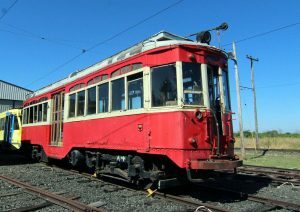 Issaquah historical society purchased the interurban for restoration to be used on the Issaquah trolley. Soon the organization decided it did not fit their needs and offered for sale. One of our members purchased the car at auction. It took 3 years, but the museum was finally able to move the car to the museum in December 2016. We have been in contact with folks in Milan who have the technical information on this car such that we can restore it as funds allow. But the first priority is building the second carbarn.